Successful, Predictable, Cost-Effective Dental Implants in Crouch End, N8. We provide high quality, scientifically engineered dental implants at very competitive, affordable prices. We are able to achieve aesthetically pleasing results enabling to restore smiles and chewing. Confidence, knowledge and over 20 years of experience allow us to offer top quality restorations under one roof. Please visit us for a consultation and advice. We practice evidence based dentistry and always deliver the best possible results to our patients. Currently, dr Monika is completing Diploma in Implant Dentistry at FGDP in Royal College of Surgeons of England. She travels across the Europe to learn from the best implantologists and masters the skills and techniques. Rest assured you will be offered safe, predictable and long lasting restoration at affordable prices. We will deliver the best. A dental implant is a titanium screw that replaces the root of the missing tooth and is firmly integrated with the jawbone. What are the implants for? They are used for replacing a single or multiple missing teeth. They can be used in form of single tooth replacements, bridges or to stabilise the dentures. The stabilised denture can be significantly reduced in size to aid comfort in eating and speaking. The dentures can be semi-permanently screwed into the dental implants or be held with precision attachments. 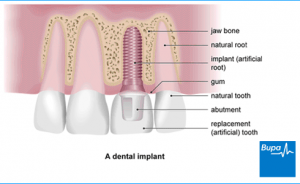 What are the advantages of having an implant? The main advantage of having an tooth substitute is to avoid damage to adjacent teeth in order to replace one or more missing teeth as it would take place with the conventional bridges.By choosing this option, the patient saves lots of trauma to the healthy teeth and possible infections and root canal treatment at the later date. It imitates the tooth in very natural way and provides good aesthetic and function to the mouth. In healthy mouth and well-maintained oral health, the tooth substitute will last life-long. A dental implant also prevents a bone resorption and collapsing of the dental alveola bone and cheeks and lips. It holds other teeth in place by stopping other teeth from drifting into the gap from the missing tooth. Who is suitable for them? Anyone who has lost teeth or who are dissatisfied with their dentures or dental condition and want to feel more confident when smiling, laughing, eating and talking are suitable. Although, in some cases the structures of the mouth may prevent the use of an implant. If you are healthy enough to undergo routine dental extractions, then it is more than likely that you will be suitable for them. Generally, people who have uncontrolled Diabetes, Haemophilia, Leukaemia, other blood-related diseases or are on Steroid Therapy are not suitable for implants. Consult your dentist for advice. The procedure is generally very simple and only takes a short time depending on each individual case.The procedure is usually performed under local anaesthesia so no pain is felt. There is a little discomfort immediately after surgery, which is to be expected. Patient will need to take mild painkillers and stay on a soft diet for few days. What to expect afterwards? After placing an implant in the bone it will be left to integrate for a period 3 to 6 months. Subsequently, the patient will have an appointment to x-ray the implant and confirm the integration with the bone. The final ceramic restoration will be made.